Being one of the Artists in Residence here is very special. Beginning in January 2018, artist Irene Godfrey and myself would meet and talk tentatively, at first trying to find a way into the rich history of the Church. 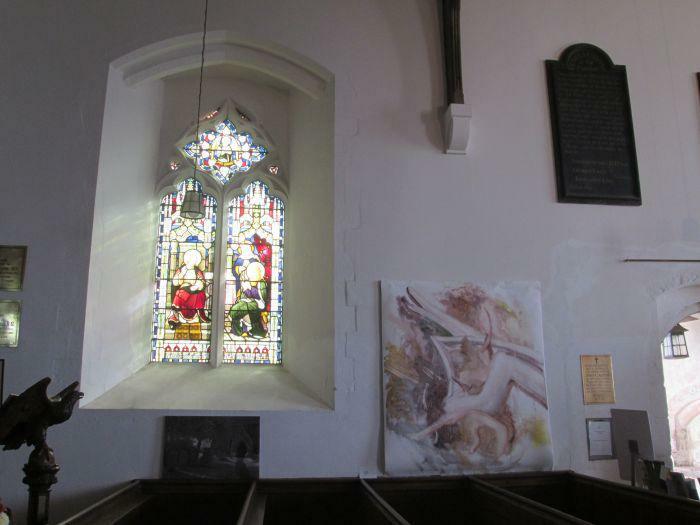 We had not worked together before as artists, but we are both on The Friends of St Mary’s committee and live within a few minutes of each other in lower Higham. It is a great opportunity to share ideas which makes for an enjoyable and creative time together. My take on it all. I have been wanting to get close to the carved stone heads of King Stephen and his daughter Mary de Blois outside to the left of the Church for some years. So this is where I started. I needed some help, so Richie Sloan (another committee member) and myself went off to the Church with a long ladder and my camera to get some close-ups of these stone carvings. I wasn’t disappointed but it didn’t stop here! Soon I started looking at all the other faces around the Church and realized that there are so many. Taking photographs perched on a long ladder was an interesting experience ! One or two I needed Richie to do for me. I thought a slide show would be good so I asked Dave Bowdler who is a musician and another committee member if he would like to arrange some music to it. I wanted to isolate and focus on their faces, get close up and somehow bring them alive. I feel black and white helps this. Who were these people and who carved them? I’m often caught by the idea of the amount of faces that have come through the Church over the years. And of course there is the ancient oak door of the Church with its green men, old bearded man and faces peering out, and a bird too. With the help of artist Dianne Reeves we were able to take a few moulds which you can see displayed. The next part of the project will be to make a book called St Mary’s Face Book. Irene and I are planning to carry on our residence into 2019. I am interested in the stories of the nuns who lived at Higham Priory from the 12th to the 16th centuries. I have been looking at church wall paintings of this period and imagining what those at St Mary’s might have looked like. I have started to make a short series of works based on selected prioresses’ stories inspired by the wall paintings of the time. I am researching the lives of the prioresses and thinking about what freedom of choice, if any, these women may have had. I have visited churches with wall paintings, notably St Mary’s Church, Kempley, Gloucestershire and St John’s, Clayton, West Sussex and referred to Roger Rosewell’s book ‘Medieval Wall Paintings’. I am initially working with pastels on primed paper in earth colours that resemble the hues of rediscovered wall paintings. 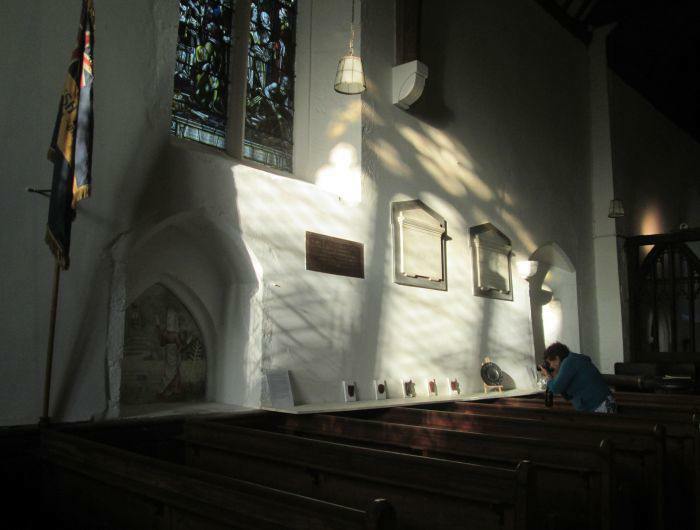 I have chosen to make each work fit an alcove in St Mary’s Church. This not only gives the illusion of the work being painted directly onto the wall but also gets over the problem of how to hang work in the church. The works begin as composites of motifs from actual wall paintings. I then grade them up to the required size and work into them. Mary had a life in both the secular and the religious world. Daughter of King Stephen, she was prioress, then abbess before being abducted by and married to Matthew of Alsace. She returned to her religious life later when the marriage was annulled. I have chosen to depict her as half nun and half princess using the ‘bacon and egg’ colours typical of some existing 12th century wall paintings. Her head is based on a mid 13th century painting in Horsham St Faith Priory, Norfolk. I have placed her on the North wall nearest to the Lady Chapel which is dedicated to St Mary. Amphelisia’s is a watery story (she failed in her duty to upkeep repair of the causeway leading to the Thames ferry). Therefore I have placed her on the North wall opposite the church door where, according to John Viger, there would have been a large wall painting of St Christopher (who, legend has it, carried travellers across a dangerous river).